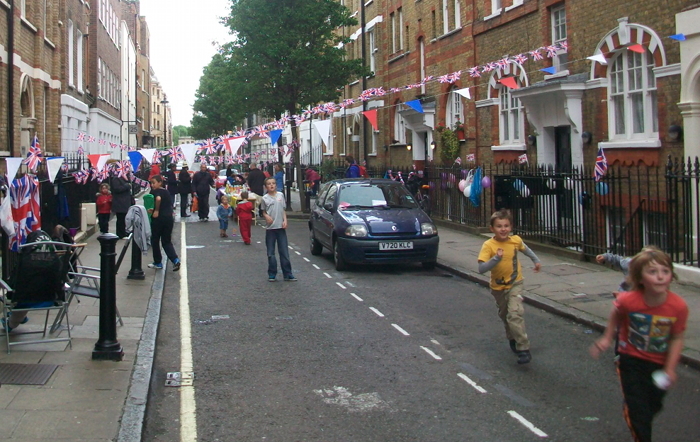 Children played in the road at Gosfield Street Jubilee Party. The rain held off and neighbours who had been living only doors away for many years greeted each other for the first time. Gosfield Street in Fitzrovia was closed to motor traffic and children played in the road. As one resident said: "This is how it used to be, and how it should be." Capturing the fun on camera. 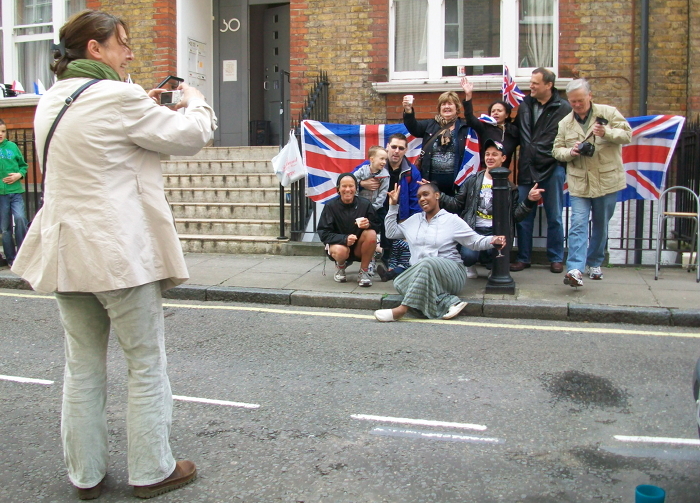 A couple of residents in Gosfield Street had got together earlier in the year and decided to organise a jubilee street party on Monday 4 June. Met with a lack of enthusiasm from some of the neighbours at first, the event turned out to be a huge success. The little street was full of life and people discovered neighbours they never knew they had. Some surprise guests turned up at Gosfield Street party. 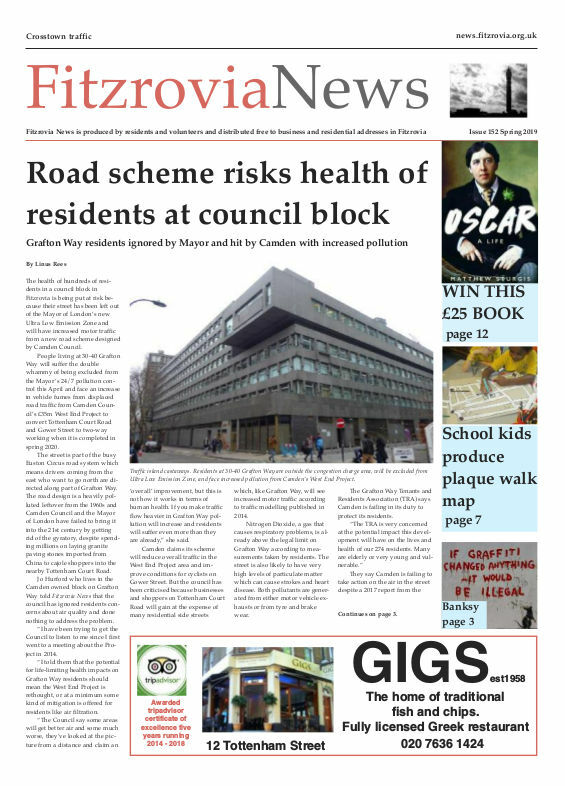 One resident told Fitzrovia News that the street has had a bad reputation for many years but has improved recently. People have tended to keep to themselves but more recently there has been a revived sense of community here. This is partly due to the really good street cleaner. “He’s really conscientious and takes a great pride in his work. It has really made a difference.” Many of the residents know the street cleaner and are on first name terms. The street party had tables full of food and drink down the middle of the street, while children kicked a ball around and played other games at one end. Some brought along a pogo-stick and some of the adults tried to have a go. Donations of tables, food and money were given by all sorts of people, and Westminster City Council allowed the street to be closed so that for one day only it could be turned into a dining room, a place to chat, and for children to play. People passing by stopped to chat as they discovered the party in the street. 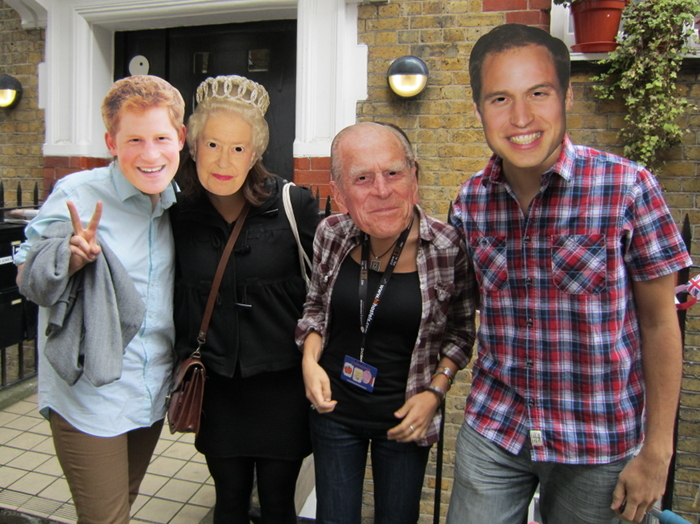 Staff from the Central London Youth Hostel came along to enjoy the fun wearing some royal family masks. “There are a lot of children and families here and at times and it would be great to close it to motor traffic all of the time,” said one woman. “There are other streets like Hanson Street which also have a lot of families with children which could benefit from being closed to traffic,” she said. Artist Pascalle Edwards came along to paint children’s faces. She lives in Covent Garden and was passing through the street and asked if she could come along and paint children’s faces. She described Gosfield Street as “a very quiet street with very friendly people living here. It’s in a part of London that can be very lively, but at weekends it is very calm. It’s a great part of London,” she said.